Have you ever wondered about the primary cause of Psoriasis or how do you get Psoriasis. If you have, this post will provide you with answers you’ve been looking for. Psoriasis is a non-contagious skin condition which troubles many people in almost every part of the world. The most common symptom of this condition is the visibility of red papules which combine with each other to form plaques of thick and scaling skin. The most common cause of Psoriasis or these dry skin flakes is considered to be excessive and rapid proliferation of skin cells. According to health experts, it is mostly triggered because of abnormal lymphocytes. In most cases, this skin condition affects the skin on your elbows, knees and scalp. Mild Psoriasis is one of the most common medical problems. There are many elderly and even young people who suffer from this condition. Most of the people have dry and faint skin patches which may not be clearly visible. Due to this, it becomes very difficult for people to even suspect and realize that they’re suffering from a skin condition. On the other hand, bodies of patients with severe Psoriasis are entirely covered with thick, red and scaly skin. It is important to understand that Psoriasis is an incurable and long term skin condition. According to most health experts, Psoriasis has a variable course. In layman’s terms, this skin condition worsens and improves periodically. For some days, you may notice bit patches of dry, scaly skin which will eventually fade away for some time. In fact, your skin may be clear of any symptoms for years in remission. Usually, worse symptoms of this condition appear during winter months. Here’s some information about how do you get Psoriasis. According to medical professionals, the exact cause of this skin condition is still unknown. Doctors don’t have a clear idea why this condition occurs and what causes it. However, they still believe that Psoriasis may be caused by a combination of external factors, including an individual’s genetic predisposition and environment. It has been noted that members of the same family or blood line has this condition. Your body’s immune system also plays a very important role to determine the severity of this skin condition. Medical professionals have been conducting studies and researches for the last three decades. 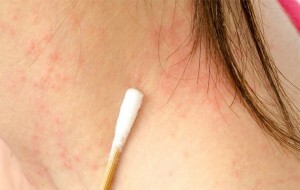 However, the primary cause of Psoriasis is still unknown. As mentioned earlier, the most common symptoms of Psoriasis are visible red or pink areas of thick, raised and scaling skin. Most of these symptoms are clearly visible on your elbows, knees and scalp. There are no specific areas where you may notice mild symptoms. They can appear anywhere on your body. However, they’re more likely to occur in areas closely related to trauma, scratching and abrasions. Nail Psoriasis – This is also a common type of Psoriasis. If you’re suffering from nail psoriasis, you will see some small pits around fingernails and toes. You may also see some yellow-brown separations adjacent to your nail bed. Such separations near your nail bed are called oil spots. Most people confuse nail psoriasis with a regular fungal infection. Due to this, a proper diagnosis is delayed and the condition worsens. Scalp Psoriasis – Scalp Psoriasis is usually confused with basic dandruff. In this condition, dry flakes of your skin and red areas are clearly visible on your scalp. For treating this skin condition, most doctors use the same treatment used for treating seborrheic dermatitis. Most people don’t realize this, but genital lesions are also quite common in Psoriasis. Genital lesions may occur as red and flat patches in moist areas like navel and buttocks. If genital lesions occur on your body, they will be clearly visible for a long period of time. One major diagnostic problem with Psoriasis is that its symptoms resemble other skin diseases. Therefore, Psoriasis can also be confused with yeast infections, regular skin irritation, fungal infections and bacterial infections. Now that you have understood how do you get Psoriasis, let us explain various treatment options for this non contagious skin condition. Although the primary cause of Psoriasis is still unknown, there are still various treatment options for Psoriasis. A doctor will choose a course of treatment according to the type of Psoriasis, severity of the condition and body area which has been covered with spots. Mild Symptoms – If only some areas of your body are covered, it means you’ve been experiencing only mild symptoms. A doctor may advise topical skin creams, lotions and sprays. These treatment options are safe and effective on mild symptoms. Some doctors may even advise use of steroids onto tough and resistant isolates psoriatic plaque. Severe Symptoms – If over 25% of your skin is covered with symptoms, it means your condition is severe. Thus, topical products like creams and lotions may be ineffective. If you’re suffering from a severe case of Psoriasis, you may need UV radiation treatment and systemic medications. However, these medications may have some side effects. Severe Psoriasis may even lead to Psoriatic Arthritis. In order to stop the progression of permanent joint dysfunction and Psoriatic Arthritis, you would definitely need systemic medications. Topical treatments will be completely ineffective. While choosing a proper course of treatment for your condition, you will have to consider some important factors. You need to make sure that medications don’t have any serious side effects. In fact, some medications may not be effective for certain individuals. A medical professional or physician will explain your options much better. You also need to ask your physician about various risks associated with a course of treatment.